Government attorneys rested their case on Tuesday in their lawsuit to block AT&T's $85 billion purchase of Time Warner as the two company's top executives prepare to testify. AT&T had already started calling witnesses last week due to a scheduling issues with the government's final witness, RCN Chief Executive Jim Holanda. On Wednesday, both Time Warner CEO Jeffrey Bewkes and John Stankey, AT&T's Senior Executive Vice President in charge of the Time Warner merger integration planning, will take the stand. Holanda testified that three of the ten most-watched networks for their cable customers are Turner networks and that in recent years, their programming costs have "been going up significantly ... five to eight times the amount of inflation." Holanda said he feared that with AT&T's takeover of Time Warner, the telecom giant would charge more for Turner programming, putting RCN's offerings at a disadvantage and then essentially allowing them to "steal my broadband customers." Holanda cited Comcast's merger with NBCUniversal in 2010 as a real world example of this. 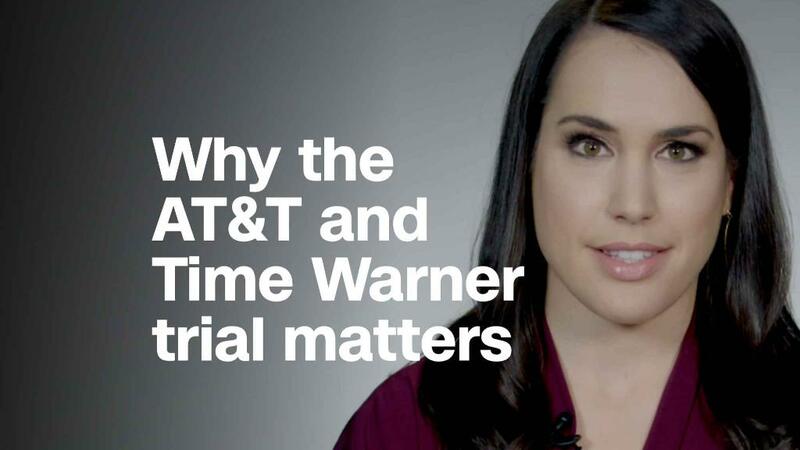 That merger has come up frequently during the trial as a model closest to AT&T's proposed vertical media merger, where a distributor takes over a content programmer. After Comcast and NBCUniversal merged, new restrictions placed on RCN's contract with NBC meant that they could no longer offer NBC as part of a smaller bundle with just basic broadcast television networks, Holanda said. Instead, NBC had to be bundled to customers with other cable channels within the NBC family. As a result, RCN could no longer offer what Holanda said was a popular basic television plus broadband package in certain parts of the country. Before the Comcast and NBCUniversal merger, Holanda said this was not an issue. He said the restrictions came into play after the merger -- and soon after, Comcast came in with their own basic product, similar to what RCN once offered. In a statement an NBCUniversal spokesperson said, "Like all programmers, NBCUniversal seeks the widest possible distribution of its networks with all of our partners. NBCUniversal has engaged with RCN fairly, on terms that are consistent with other distributors." The arbitration offer Turner provided to distributors late last year was "a good start," Holanda said, but it was "missing some fundamental things." Holanda said it didn't cover the full scope of what AT&T would own, like HBO, and the offer should be for ten years, instead of the proposed seven. He also said the offer did not go "far enough" to protect technical rights and that the distributors should have more access to information during the arbitration process. Turner is a division of Time Warner that includes TBS, TNT and CNN, among others. Turner extended the arbitration offer to 1,000 distributors last November after the Justice Department filed its suit. The offer guarantees Turner will arbitrate any disputes with distributors, like a cable company or a new streaming service, and guarantees against blackouts in which the channels are taken off the distributor as a result of an impasse in negotiations. Turner's current offer is blind, and offers "baseball-style" arbitration, meaning each side makes an offer and an arbitrator decides which offer to accept. On cross examination, Holanda acknowledged that at least half of the customers who are leaving RCN's cable services are cord cutters -- meaning they're not going to a rival cable operator. He also acknowledged that the industry is more competitive now than it ever has been before, and that their profit margins for video services have been decreasing for some time, independent of a possible AT&T and Time Warner merger. Holanda also said he did not know until testifying on Tuesday that Turner had offered the NCTC (a co-op of smaller cable distributors) to be included in the Turner arbitration, as an exclusion from the offer was initially a major concern of his. He also acknowledged that he has previously advocated for the type of arbitration Turner is offering. The afternoon concluded with testimony from David Christopher, the chief marketing officer of AT&T Mobility Entertainment who testified that AT&T's traditional pay TV business has fallen on tough times, losing more than a million customers last year. In cross-examination, government attorney Dylan Carson said that AT&T has claimed to have around 25 million video subscribers for each of the last three years, but Christopher contended that the consistency was due to the success of the company's over-the-top offering of DirecTV streaming service DirecTV Now. As the government rested its case in the afternoon, AT&T and Time Warner lead attorney Dan Petrocelli filed a motion to dismiss DirecTV as a defendant in the case, saying the "government has failed to state a claim for relief against DIRECTV, which is not a party to the challenged merger, much less an acquirer of any stock or assets." Petrocelli alleged in the motion that the government only named DirecTV as a defendant so that they could introduce "hearsay evidence," statements made by DirecTV on issues like Comcast and NBC's merger before it was acquired by AT&T.